PLAYER VERDICTS: Lethargic, lacklustre and probably knackered! Ryan Tafazolli wins this header in the 1-1 draw with Doncaster. Photo: Joe Dent/theposh.com. Peterborough United delivered a lethargic, lacklustre display in today’s (January 1) 1-1 home draw with Doncaster Rovers. Danny Lloyd’s 10th goal of the season almost sealed victory, but Doncaster claimed a deserved last-gasp equaliser. Posh captain Anthony Grant tries to dive between two Doncaster players. Photo: Joe Dent/theposh.com. 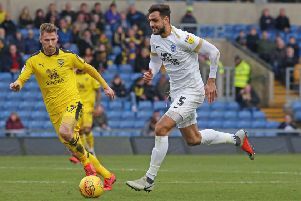 Lloyd was excellent in the first-half and Chris Forrester played with promise, but central defender Ryan Tafazolli was the Peterborough Telegraph’s star man. To be fair to the Posh players they have just come through a very hectic schedule of 18 games in 65 days. Leo Da Silva Lopes: (for Doughty, 62 mins). Junior Morias: (for Maddison, 86 mins).